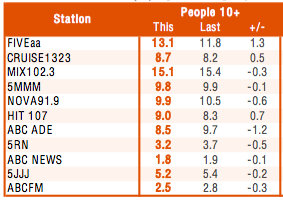 The fall of the ABC’s talk station is mirrored by the rise of FIVEaa which has consolidated its second overall position behind perennial leader Mix 102.3 in the GfK ratings survey five released this morning. FIVEaa’s breakfast team of David Penberthy and Will Goodings has consolidated its lead in the key shift, with the commercial talk station putting on listener share across its schedule. The story is the opposite at the ABC, which has fallen to a level even below its slump at the end of 2017. ABC Radio Adelaide has captured 8.5 per cent of listener share – a 1.2 percentage point drop on the previous survey. In the same survey last year, the ABC achieved 10.1 per cent of share and was the clear leader in breakfast. Today’s performance puts it behind classic hits AM station Cruise 1323 – and every other commercial station in Adelaide. By comparison, leader Mix is on 15.1 per cent – slightly down on the previous survey – with FIVEaa on second position at 13.1 per cent (up 1.3 percentage points). 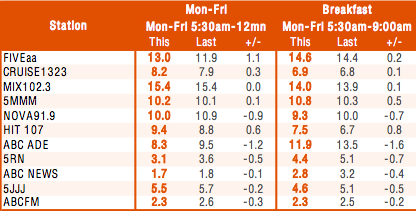 Nova, Triple M and hit107 are all rating in the nines, with Cruise on 8.7. The ratings show trouble across the schedule for ABC Radio Adelaide. Ali Clarke’s breakfast program, once the leader, has fallen by 1.6 percentage points to 11.9 – well behind FIVEaa on 14.6 and Mix on 14. David Bevan’s mornings shift lost 2.1 percentage points to hit 7.8 – roughly half the share of talk rival Leon Byner on FIVEaa who lifted his ratings to 15.2 per cent (behind leader Mix on 15.5). In afternoons – a confused period now for ABC listeners with current affairs, a syndicated music show and locally-produced talk – ABC Radio Adelaide also lost share to be well behind all commercial comers. Jules Schiller’s Drive program dropped 1.3 percentage points to sink to eighth place. ABC Radio Adelaide’s 5.7 per cent share puts it behind stablemate Triple J on 6.5 and Cruise on 7.8. The Drive leader is Mix. FIVEaa is now the clear leader in the late afternoon sports shift, well ahead of Triple M – which has split its Drive schedule between local sport and a syndicated show out of Melbourne. In the Evenings, once owned by the ABC’s Peter Goers, FIVEaa has extended its lead with an offering of Jon Blake followed by veteran Jeremy Cordeaux. Goers was the one positive for the ABC, putting on 1.3 percentage points, but this came after a low previous survey. He sits in third place behind FIVEaa and Mix. ABC Radio Adelaide again lost share in the older demographics which comprise the bulk of its audience.